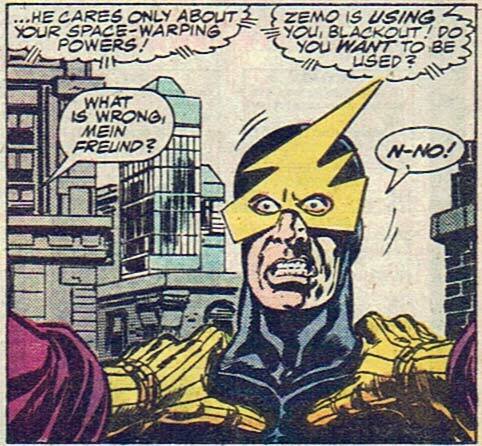 Electro: Dammit, I told you I only wanted FIVE lightning bolts on this mask, not SIX! Haberdasher: Right away, sir, my apologies. snip snip There, all better! Blackout: Haberdasher, I need a mask! Something with lightning! Haberdasher: Certainly, I'd be happy to make one up for you, only $1,000. Blackout: Crap, I only have fifty on me. Haberdasher, thinking: Hm, I can give you a one-bolt mask out of a remainder for that. I bet that thing gets caught on the top of the car door frame every single time. On the plus side, if his electrical powers should ever fail him, he can always lower his head and charge like Rhino, so there's that. 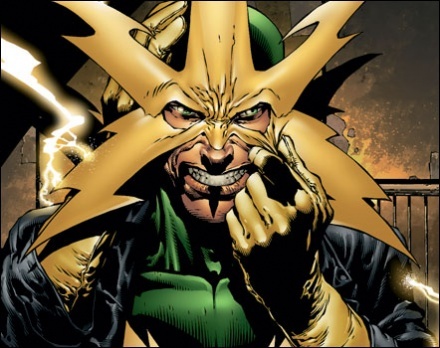 The funny thing (other than the mask) is that this guy’s powers had nothing to do with electricity whatsoever.